Ha, too funny. How many times have you invented a drink, only to realize it’s already been done? 😀 Glad we planted the seed for you! But the funny thing is: the 77 isn’t in the copy of the booklet we have. We’ve got The St-Germain Cocktail (equal parts bubbly and StG topped with soda water), the previously mentioned French Apple Martini (1.5 apple vodka, 2 StG, 0.25 lemon) the Mojito Parisian (mint, rum, StG, lime, and the Martini de Sureau (vodka, StG, pinapple, lemon). I wonder if they’re putting different drinks in different batches of booklets. Oops! We have the same booklet. The recipe is on the website, not in the booklet. Yum, that sounds delish! 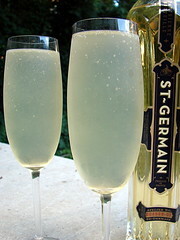 I love St. Germain, but have not yet experimented mixing with it. Heya, Mike! I mixed this up for Russell on Saturday. He’s more a fan of sweet than sour, so we kept upping the elderflower till it was good for him. The final count was 1 1/2oz St Germain, 2oz Hendrick’s gin, 1oz lemon juice. I’ve just made it again for myself the same way, and thought you’d like to know. LAST NIGHT DINNER PARTY WAS FUN .WE STARTED WITH ST. GERMAINE. SOUTH AFRICAN CHRADONNY AND ST. GERMAINE. SPARKLING WATER LEMON AND ST GERMAINE. iT IS DELICIOUS.